This model is better than average quality, has the most popular features, and is available at a great value at price point. It's our second highest rated model, and makes a great choice for someone getting started or who isn't going to do a lot of sous vide cooking. If the price on this model ever rises above $100 it usually means it's out of stock, the Anova Bluetooth Sous Vide for $129.00 is a better deal, if you're looking for something less expensive consider the for $69.99 . $87.99 Current Price - YOU SAVE $44.94. The Wancle Sous Vide Precision Cooker is a better than average immersion cooker. It doesn't have any Bluetooth or WiFi connectivity, but it gets the job done if you're just interested in a basic cooker. If you're serious about sous vide cooking we suggest the Anova Bluetooth Sous Vide it has a few extra features and is only slightly more expensive. Quality is better than average. Heating element enclosed in stainless steel tube. This model features an alligator style clip that you slide down over the side of your cooking vessel. As we noted in other reviews, this makes it easy to put on or take off, but it doesn't give you a lot of adjustment capabilities. The clamp, handle, and display weren't bad, they just didn't feel as elegant and streamlined compared to the others models. This shape of this unit is different from all of the other units we looked at. Where the others were all tall and slender this one stuck out as being much wider. This is due to the display being located on the side instead of on the top like most other units. This model is 14" high making it one of the shorter units, but it's nearly 7" wide. The tube containing the heating element is under 3". The unit felt fairly solid in construction and quality. This model puts out 850 watts, putting it on the low end of the models we reviewed, so it will take longer to reach the desired temperature. It has a maximum temperature of 211°F which was on the high side of all the models we looked at. Most people aren't going to need temperatures that high, but if you do this should be on your short list. The stubby design of this unit affected it minimum water depth which is 2.75" the maximum water height is 10", so you're going to need a tall cooking vessel if you choose the Wancle. It can heat a maximum of 4 gallons of water, and the pump is rated for 1.8GPM which is average. The noise level from this model was middle of the road compared to other models. The display and controls for this unit are located on the side. This does make it slightly more awkward than the models with the display angled on the top or directly on the top. It's not a deal breaker, but it's something we noticed being different. Once you turn the unit on the temperature is set via the scroll wheel on the side of the display. It was fairly easy to use. Like all sous vide machines the lack of buttons makes setting a timer ridiculously more complex than it needs to be. Honestly, it's a lot easier to just use a standard kitchen timer. 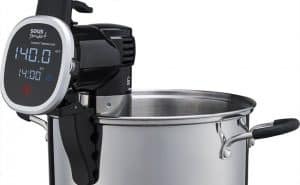 This model has no WiFi or Bluetooth connectivity, if that's important, consider the Anova Bluetooth Sous Vide. This model has everything most people will need in a Sous Vide cooker, without the Bluetooth or Internet connectivity, which keeps the price down. The controls being on the side is a little awkward, but shouldn't be a deal breaker for most people. 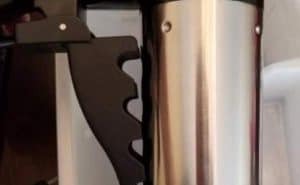 The design does mean you'll need a cooking vessel that's taller than it is wide, but again this isn't a problem for most people. This is a good quality budget friendly choice. 11.1" x 14.8" x 4.5" 14.8" x 2.8" x 2.8" 12.8" x 2.2" x 4.1"
The Wancle Sous Vide is our second highest rated model, it has the features most people are going to need, making it a lot more budget friendly than some other models. It's a good quality model available at a great value price. The VacMaster SV1 Sous Vide is great at heating large volumes of water and has an extremely high power rating.